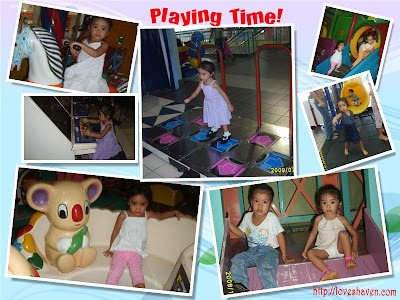 LOVE's Haven: MM: Playing Time! As working parents, hubby and I see to it that we could spend quality time with our little Danielle especially during weekends through letting her play whatever she wanted to. Usually we spent it together strolling around the mall, playing at Quantum, Wonderland, World's of Fun and etc. lotta fun for the angels.. i like your presentation, so neat.. my entry is up too..
She's very cute on the second shot from the left, second batch of photos. happy mommy moments! gakalingaw gyd ko sa mga pose ni entet! Murag naay gyd cyay giliwatan na mau mg pose...ehehehe! abah, at sumasayaw pa sa dance revo. haha! 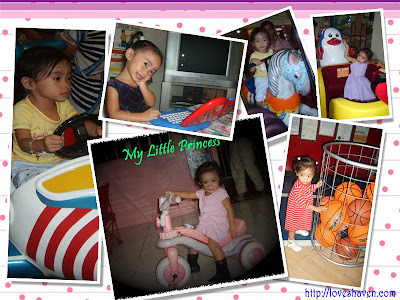 nakakamiss tuloy mag-arcade oh..
future dancer..di ko pa natry yong dance revo..buti pa baby mo..he..he..
lovely digiscrapped pics =) and your lil girl is cute ..